Have you ever been on a road trip and took a bathroom break only to feel the need to stop again 30 minutes later? Annoyed parents everywhere shake their heads at their kids while pulling over before the upholstery is ruined. Kids are notorious for this, but I’m an adult and this happens to me sometimes. Of course, I stop and take care of business before I go along my merry way. However, if I apply this circumstance to food, I would scoff at eating a mere 30 minutes after finishing a meal. If I don’t think twice about honoring my need to use the little girl’s room, then why do I question my body when it’s hungry? There were times when I would finish a meal, feel content, and then become hungry again after a short period of time. What the hell? I would tell my stomach, “I just fed you! How much more food could you possibly need?” Initially, I said it with disgust. Over time, my tone changed into one of curiosity and self-compassion. More importantly, it lacked judgement. I wondered if the water I drank with my meal gave me a false sense of fullness. Or maybe I simply did not hear my body correctly and failed to give it enough fuel at the time. I no longer dwell on this anymore because I am not bound by food rules or arbitrary meal times. I just eat if I need to. I remember one time I ate what I thought was enough for dinner. It was one of those hungry days for me and whatever I had had for dinner wasn’t substantial enough because about an hour and a half later I felt ready for another meal. I ended up going to Subway and ordering a 6-inch sub. The idea of eating a whole 6-inch sub was appalling to me. It seemed like so much food! When I sat down with my sandwich, I kept on telling myself that I shouldn’t eat more because I just ate dinner. Not surprisingly, as I ate the sub, my stomach stopped growling and the hunger pangs subsided. My body genuinely needed more food. This was the first instance where I truly let myself eat freely in response to my hunger. I left Subway with a content stomach and a preview of what it feels like to eat intuitively. One of the key ideas of IE is allowing yourself permission to eat. While I initially took this to mean eating what I want, I now know it goes beyond that. 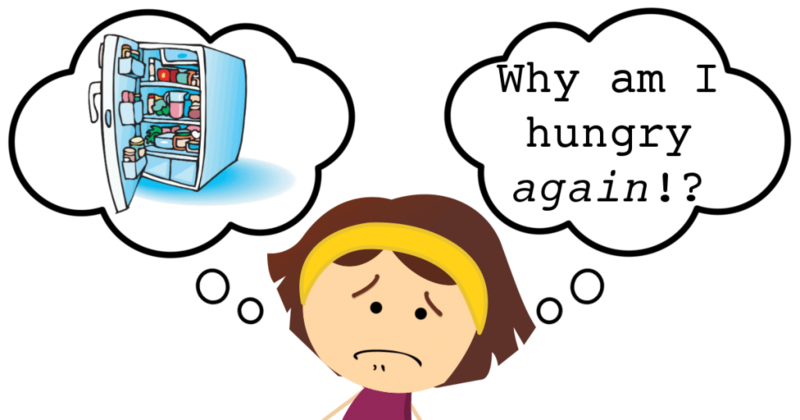 I can not only eat what I want but when I want and how often I want. If you struggle with this idea as I once did, just ask yourself, “If I had just peed,2 and had to pee again, would I stop myself from using the restroom?” It’s no different with food and eating. You’re trusting your body and honoring a basic, biological need. Do you ever get hungry again shortly after you eat? How do you respond? Please share in the comment section below. 1And it still happens. I’m human. 2I know “peed” isn’t the most lady-like of terms, but that’s what came out of my head as I typed! Very interesting analogy! I have had that very same response “what the hell” before but never considered that my body needed more. It makes me realize how much my mind (that sometimes hyper monkey) tries to run the show with its never ending chatter. I agree that our minds take over when our bodies try to speak to us. We just need to listen. I love the comparison with other bodily functions, Deborah! When we stop to think about it, it seems really ridiculous that we would be taught to honor the needs of our bladder and our bowels, but taught to ignore those of our stomachs. It’s silly to expect that they would be able to tell time and only interrupt our day at predetermined intervals that are convenient for us. Thank you for shedding a little light on how we can be more compassionate in our response to what our bodies truly need! I’m glad the bodily functions comparison resonated with you! I also think that showing a little more self-compassion is something many of us have to work on in general.